Manila, Philippines -[ November 9, 2013 2nd Update] Monster typhoon 'Yolanda' (with international name Haiyan) leaves at least 100 people dead as the storm surged Friday, November 8 in the hard-hit areas of Visayas region. Captain John Andrews, deputy director general of the Civil Aviation Authority of the Philippines reports that some bodies were found lying in the streets. In Visayas areas, nearly all houses in Tacloban, Leyte province with a population of about 220,000, were toppled and casualties were feared to be massive, NDRRMC said. "Almost all houses were destroyed, many are totally damaged. Only a few houses are left standing, but with partial damages," Major Rey Balido, a spokesman for the National Disaster Risk Reduction and Management Council (NDRRMC) said. In the latest update from DSWD-Central Visayas, as of 6am: 846,114 families w/ 3,805,142 pax are affected by #YolandaPH in Bohol, Cebu, and Negros Oriental. Meanwhile, DSWD Region VIII reports that 10,291 families (57,683 pax) affected by #YolandaPH in Tacloban City, Southern Leyte, Northern Samar and Western Samar. Data gathering continues. The Department of Social Welfare and Development (DSWD) assures that there is a sufficient amount of relief goods for all the regions that are affected by Typhoon Yolanda, which has just entered the Philippine area of responsibility (PAR) midnight of Wednesday. The Armed Forces of the Philippines (AFP) also responded for the relief and rescue efforts for the areas affected by Typhoon Yolanda: Metro Cebu, Guimaras, Iloilo, Aklan, Negros Occidental, Albay and other areas. AGASA released final weather bulletin on Saturday, November 9, 2013 at 3:30 pm for Typhoon 'Yolanda'. The weather bureau said that Typhoon 'Yolanda' is now outside the Philippine Area of Responsibility (PAR). At 3:00 PM today, the eye of Typhoon “YOLANDA” was located based on all available data at 722 km West of San Jose, Occidental Mindoro (13.6°N, 114.5°E). Typhoon Yolanda has a maximum sustained winds of 185 kph near the center and gustiness of up to 220 kph. It is forecast to move West Northwest at 35 kph. Typhoon “YOLANDA” is expected to be at 943 km West Northwest of San Jose, Occidental Mindoro this evening. PAGASA advised that all Public Warning Signals are now lowered. However, sea travel is risky over the seaboards of Luzon, and over the eastern and western seaboard of Visayas. With this development, this is the final weather bulletin for this weather disturbance, PAGASA said. For complete NDRRMC report on actions taken by government in the wake of typhoon Yolanda (November 9, 2013), view here. 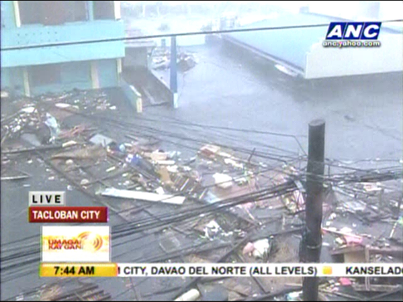 ABS-CBN's Atom Araullo and his crew had witnessed how Super Typhoon 'Yolanda' damaged the Tacloban Downtown on Friday morning.